When both projects are complete, peak time service frequencies on the Charing Cross branch would increase from 20 trains per hour to 32 northbound, and from 20 to 28 southbound. The number of rush hour trains on the Charing Cross branch would rise from 20 to 28 in both directions. Under the proposed system, all Charing Cross branch services would terminate at Kennington and passengers travelling further south into Wandsworth would switch to City branch services to continue their journey. Passengers travelling from south London to Charing Cross branch stations would need to change trains at Kennington. “This scheme is the best prospect for easing the overcrowded conditions commuters endure on a daily basis. The sooner works can get underway the better. Splitting the line will simplify the service pattern, meaning both branches will run faster and at a higher frequency. It’s not ideal for those commuters who will have to change at Kennington but their overall journey will be more reliable. “The east of our borough is heavily dependent on this service and we’ll keep up the pressure of TfL to make sure these improvements are treated as a priority. The line's signalling systems are currently being overhauled and works to split the service would follow on from this upgrade. 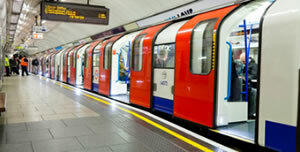 The Northern Line is the busiest service on the underground network, carrying 660,000 passengers every weekday. TfL forecast demand will continue to rise.